Women writers are having their say about the “War on Terror” and the wars in Iraq and Afghanistan specifically in a spate of recent novels and short story collections. In the past, most novels and stories dealing with war and its consequences have been written by men. So these authors bring a much-needed female perspective to the subject. However, their gender does not define or limit their attitudes and conclusions, just as it does not with male writers. The work of Helen Benedict, Siobhan Fallon, Roxana Robinson, Amalie Flynn, Beverly Gologorsky, and Lea Carpenter is not at all uniform or monolithic in approach or results. One author stands out from the others with her stylistic choice: Katey Schultz has written a collection of “flash fiction,” very short stories that are the equivalent of a snapshot of a character, a place, or a moment in time. Her recent collection, Flashes of War, features 31 selections, most of which range in length from two to five pages, although there are a handful of stories in the 12 to 17-page range that anchor the collection. While each story has its own compact power, in part precisely because of its conciseness, the cumulative effect of reading these 31 stories over 164 pages is like watching one of those gut-wrenching videos of dozens of people affected by the war. We hear from soldiers on duty, bored and feeling useless at the FOB (forward operating base), training to become warriors, or returning home profoundly changed. We hear the heartbreaking voices of the women left behind, waiting and chewing on their fingernails: wives, girlfriends, mothers, sisters. And we also, crucially, hear the voices of Iraqis and Afghans — civilian, military, insurgent, Islamist, young and old, male and female. All are trying to make sense of surreal circumstances that defy interpretation by the rational mind. One of the longer stories, “Home on Leave,” details the experiences of a young soldier on leave in Arkansas. He is perplexed by the various reactions to his return from Iraq. His family and friends treat him like a hero, but he is uncomfortable with the attention, more than he received even as a star wrestler in high school. His dirty little secret is that he has not seen combat. “Bradley hadn’t fired his M4 since Fort Jackson. Fobbits were all the same. Just a bunch of laborers, holing up inside the wire. Heck, Bradley could have spent the last ten months working for Jiffy Lube.” But a violent encounter with another vet — who left his leg in Iraq — turns the homecoming sour, showing Bradley that the war has followed him home in more than just his head. Sometimes, he learns, the enemy appears in unexpected form where you least expect him. Schultz telegraphs her potent message through carefully chosen telling details like a bag of chips that the rest of us open easily with both hands, taking the entire task for granted, but which taunts the formerly independent and capable Becca. Schultz breaks the reader’s heart in a hundred different ways in these stories. But she leaves your mind and your conscience intact, pondering the hidden costs of war. In “Pressin’ the Flesh,” a soldier who’s been at Camp Taji for seventeen months goes on a mission to press some flesh in Sadr City, to make friends with the locals. He hands out 80 bottles of water in five minutes. “Something makes me edgy being this close to civilians. Any one of them could be the next suicide bomber, ready to make the 3rd and 4th Squads just a bunch of statistics. “Don’t ask me what I’m for or against,” he tells us. “All I know is, I’m handing out bottles of water, and it isn’t enough. Next thing, kids heckle me for chocolate. Fathers shout that they want their houses rebuilt. Mothers want hospitals. They all want their schools back. They want to know why they have to wait thirteen hours in line for gas while standing on top of the largest oil reserve on the continent. They want it all, and I don’t have any of it.” He prefers the patrols, using night vision goggles and shooting anything that moves wrong or lights up. It’s morally clearer, black and white. Not complex like the faces and voices of the civilians with their very human needs. 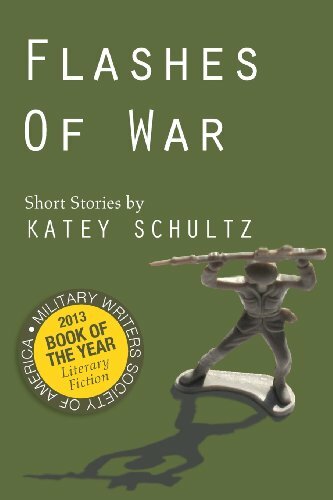 Schultz has performed an impressive feat of imagination with Flashes of War, putting us in the shoes — and heads — of all of her characters, providing a chorus of voices telling us the various truths about the last 12 years of war. When you are finished reading these compelling and flawlessly written stories, you too will be changed. Flashes of War was published by a small university press and has not garnered anywhere near the attention it so strongly deserves. Perhaps the major publishing houses were afraid of Schultz’s unvarnished truth-telling or maybe they thought few people would want to read about this weighty subject matter. But there is arguably no more important issue of our time, and this unforgettable collection of stories should be part of a national conversation, not just among readers, but among politicians, the military, diplomats, non-governmental organizations, and civilians of all stripes. Or will another writer have to write a similar collection for the next generation? Next Has the “Reading Women” movement reached critical mass? One to add to my list of *To read* 🙂 Great reflections! Thanks for the kind words. It is a must-read. You’ll read it quickly but it will stay with you a long time. Glad to have you a reader of my blog.